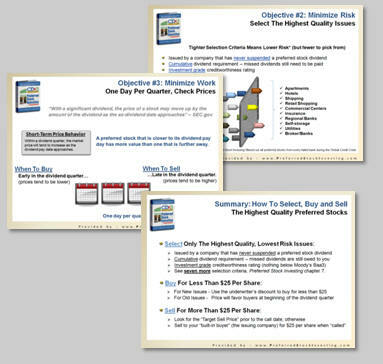 There are three techniques that preferred stock investors can use during a seller's market to take advantage of the high prices to generate additional income - the Double-Dip, Upgrading and Piling-On. The July issue of the CDx3 Newsletter described the Double-Dip technique (which is used when a preferred stock is called by its issuing company). And last month's issue discussed Upgrading (allows you to sell a low paying preferred stock and use the proceeds to buy another such that your dividend income goes up and you realize a net capital gain with cash left over when you're done). This month I'll describing the "Piling-On" technique. The data presented here is from actual preferred stocks using market prices from August 29, 2012. 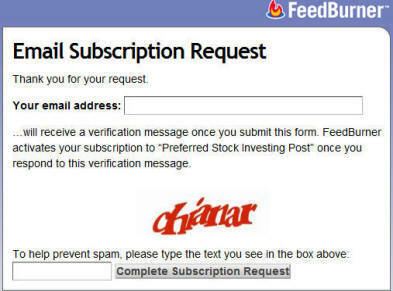 Please note that in order to protect the values of subscriptions to the CDx3 Notification Service (my preferred stock email alert and research newsletter service) the actual trading symbols are obscured here. If you are already a subscriber to the CDx3 Notification Service please see pages 2 and 3 of the September issue of the subscriber's newsletter, CDx3 Research Notes, for the trading symbols used here. Piling-On is a two-step process. The end result of Piling-On is a net capital gain and an increase in your dividend income. In the example presented here, you will realize a net capital gain of $1.86 per share and your quarterly dividend income will go up by $0.03 per share on the same principal over the same period. In today's high-priced market, preferred stocks that you purchased a year or so ago are showing a large, but unrealized, capital gain. The Piling-On technique is going to put that gain to work for you. Look over your preferred stock portfolio and find the issue showing the largest gain. In the example presented in Figure 1 we will use PFD-A, a 6.5% preferred stock currently selling for $28.55 per share (this example assumes that you originally purchased your PFD-A shares when it was first issued for $25.00 per share). At 6.5%, PFD-A pays a quarterly dividend of $0.41 per share. By selling PFD-A today you pocket a capital gain of $3.55 per share. That's over eight quarter's worth of dividend income (8.7 quarters) that you receive now, all at once. If you do not sell, PFD-A will pay you a total of $3.28 per share over the same eight quarters. By selling today at $28.55, you are paid for the next eight quarters in advance. The downside of purchasing preferred stock shares for a market price that exceeds the security’s par value ($25) is that you will be exposed to a capital loss in the event that the issuing company redeems (calls) your shares downstream. 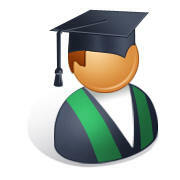 In the event of a call, shareholders will receive $25.00 from the issuing company so buying above $25 is usually risky. But what if someone else reimburses you, in advance, for that potential future loss? The Piling-On technique allows you to buy above par but still realize a net capital gain. Remember, you have already been paid for the next eight quarters on your $25 principal just as if you had held onto your PFD-A shares and not sold. The buy side of the Piling-On technique allows you to get paid a second time on the same principal for the same period, boosting your income substantially. To make Piling-On work, your buy candidate should expose you to a smaller loss than the $3.55 per share gain that you have already pocketed. Also, look for a candidate that is call protected—the further out into the future the call date is the better. Our Preferred Stock List(tm) database offered to CDx3 Notification Service subscribers allows you to list all preferred stocks trading on U.S. stock exchanges and sort them by call date and market price (see sample screen here). Figure 2 shows a partial list of the highest quality preferred stocks currently trading on U.S. stock exchanges as generated by our Preferred Stock List(tm) database. This example of Piling-On will use the first issue listed - PFD-B. PFD-B pays a 7.0% annual dividend ($0.44 per quarter) and is available for purchase at $26.69 per share. And notice that PFD-B is call protected until July 1, 2017. This example assumes that you sell your PFD-B shares at the end of the eight month reinvestment period for $25 per share, realizing a capital loss of $1.69 per share ($26.69 minus $25). But remember, you have already been reimbursed for that potential downstream capital loss since you realized a capital gain when you sold your sell candidate shares at step 1. It is the fact that we are in a strong seller's market that allows this Piling-On technique to work accordingly. Figure 3 presents the result of this Piling-On example. Remember, if you had just held onto your PFD-A shares for the next eight quarters you would have earned a total income of $3.28 per share (all of it as dividend income). Using your capital gain from the sale of PFD-A to reimburse your capital loss when buying PFD-B generates a net capital gain of $1.86 per share ($3.55 minus $1.69). Plus, rather than earning $3.28 per share from PFD-A dividends, the PFD-B shares that you now hold provide $3.50 per share over the same eight quarters. The Piling-On technique delivers a total income of $5.36 per share on the same principal over the same period. That's a $2.08 per share increase in your income. All you need is a list of high quality preferred stocks and their market prices that is able to be sorted by call date. Already a subscriber? 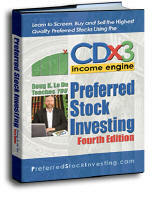 The trading symbols for this example are provided on pages 2 and 3 of the September 2012 issue of the subscriber's newsletter, CDx3 Research Notes. (Already a subscriber? 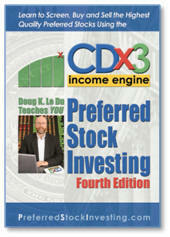 For actual symbols see pages 2 and 3 of the September 2012 issue of the subscriber's newsletter, CDx3 Research Notes). Potential Capital Gain Opportunity Next Thursday with Trust Preferred Stocks? Some investors may be thinking that there is a quick capital gain opportunity coming next Thursday when the currently open "premature call window" for bank trust preferred stocks (TRUPS) expires. 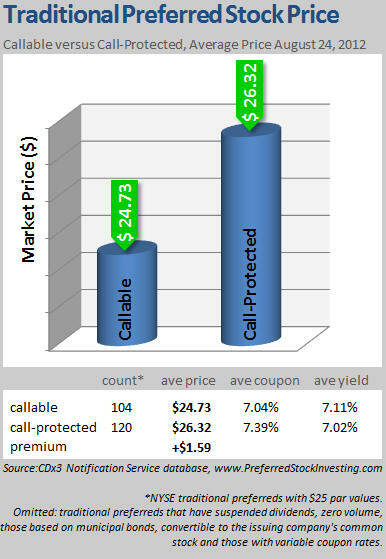 Preferred stocks that are "call-protected" tend to command a higher market price than otherwise similar preferred stocks that do not enjoy such protection (those that have exceeded their published call dates). 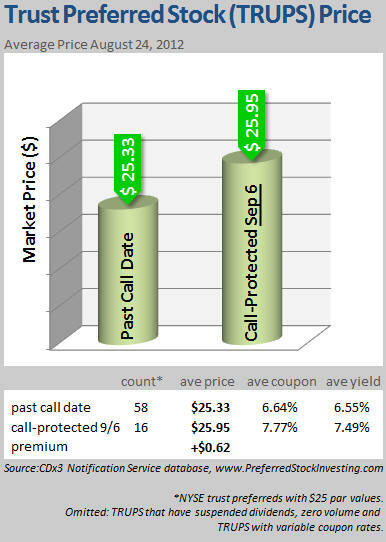 Looking at the current market prices of traditional preferreds (non-TRUPS), we can see that investors are paying an average $1.59 per share premium for call-protected issues. Since a multitude of TRUPS that are currently redeemable will become call-protected next Thursday, it is tempting to think that the market prices of such issues are likely to increase accordingly, delivering a quick capital gain to today's buyers. But preferred stock investors thinking along these lines will probably be disappointed. In fact, as compelling as this chart may appear, buying TRUPS shares today will be much more likely to produce a capital loss than any near-term gain. Here's why. As explained in the Seeking Alpha article titled "Preferred Stock Investors About To Be Cash-Rich Thanks To New Fed Action," the Federal Reserve announced on June 7, 2012 that they are considering changes to how bank reserves ("Tier 1 Capital") should be calculated in order to comply with new international guidelines (Basel III). That announcement was deemed to be a "capital treatment event." Consequently, all bank-issued TRUPS, even those that had yet to reach their published call dates, became callable during the subsequent 90 days following June 7. TRUPS that were call-protected prior to June 7, 2012 lost that protection on that date. The price premium that they were commanding in the marketplace disappeared accordingly, now at $0.62. The current 90 day window during which premature calls are allowed expires on Thursday, September 6, 2012. On that day, bank-issued TRUPS that have yet to reach their published call dates return to being call-protected. A capital treatment event occurs not just when a change is made to the formula for Tier 1 Capital, but also when it is announced that such a change is merely being considered. That's what happened when the Fed made their June 7 announcement. They did not announce a change to the Tier 1 Capital formula. Rather, the Fed announced that they were considering making a change needed to comply with new international reserve guidelines. The actual change needed to comply with Basel III guidelines is still being deliberated by banking officials and has yet to be announced. Once finalized, which can happen at any time, the Fed will announce an actual change and the implementation date for that change. The announcement of an actual change to the Tier 1 Capital requirements needed to comply with the new Basel III guidelines will, for the second time, open the 90 day premature call window for call-protected bank TRUPS. Any such announcement would presumably also include the date that the change is to become effective. On that date, when the change is actually implemented, the 90 day premature call window will open for the third time, rendering all call-protected TRUPS redeemable for the subsequent 90 days. The Fed could (and very well may) do all involved a huge service and eliminate a great deal of market confusion if they announce the agreed upon change for Basel III compliance on October 3, 2012 for implementation 91 days later on January 1, 2013. Doing so would sync up the implementation of our domestic standards, per the Dodd-Frank legislation which are scheduled to become effective January 1, 2013, with the implementation of our international standards, per Basel III. Because the Fed has two capital treatment triggers remaining regarding Basel III compliance, and can pull those triggers at any time, it is unlikely that the market prices of call-protected TRUPS will gain the premium that other call-protected preferred stocks currently enjoy as illustrated in the first chart above. It is not possible to know with certainty what market prices will do in the future. But investors considering purchasing TRUPS shares prior to Thursday, September 6, thinking that a capital gain opportunity is in store for shares that will return to being call-protected, should also consider that the Fed will open the premature call window for two more 90 day periods, rendering such shares redeemable on both occasions, regardless of their published call dates. When the Fed makes their next Basel III compliance announcement, which they have reason to make on or before October 3, 2012, the market price of call-protected TRUPS shares will almost certainly move immediately toward $25, exposing many TRUPS buyers hoping for a quick capital gain to a very different result.